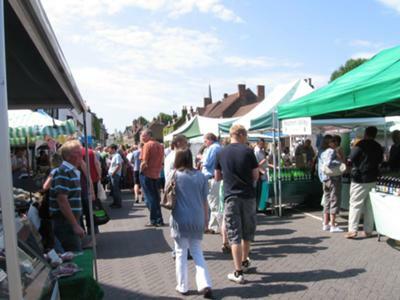 West Malling Farmers' Market is held on the fourth Sunday of every month (except December), in the High Street of this picturesque and historic market town. It is one of the busiest markets in Kent, over 50 stalls at the height of the season. You can buy all your local fresh produce, locally produced preservers, fruit juice, beer, bread, cakes and a lot more with plenty of free samples. There are a few local craft stalls and even an Ecover refill station. There is a great variety of hot food to be eaten at the market. Most months there other things going on, please check www.westmallingfarmersmarket.co.uk for details. Why not make a day of it when you come to West Malling. Most of the local shops open on market day. There are two pubs, three very good restaurants, two coffee shops and a cafe. After all that, why try one of the historic walks around the village?